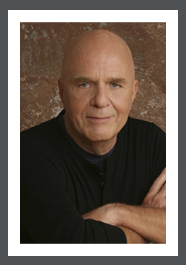 Wayne W. Dyer, is an internationally renowned author and speaker in the field of self-development. He’s the author of over 30 books, has created many audio programs and videos, and has appeared on thousands of television and radio shows. His books Manifest Your Destiny, Wisdom of the Ages, There’s a Spiritual Solution to Every Problem, and the New York Times bestsellers 10 Secrets for Success and Inner Peace, The Power of Intention, Inspiration, Change Your Thoughts—Change Your Life, and now Excuses Begone have all been featured as National Public Television specials. Dr. Wayne Dyer is affectionately called the “father of motivation” by his fans. Despite his childhood spent in orphanages and foster homes, Dr. Dyer has overcome many obstacles to make his dreams come true. Today he spends much of his time showing others how to do the same. When he’s not traveling the globe delivering his uplifting message, Wayne is writing from his home in Maui. DR. Wayne W. Dyer starred in The Shift (March 2009), a compelling portrait of three modern lives in need of new direction and new meaning. In his first-ever movie (written by Kristen Lazarian and directed by Michael Goorjian), Wayne Dyer explores the spiritual journey in the second half of life when we long to find the purpose that is our unique contribution to the world. The powerful shift from the ego constructs we are taught early in life by parents and society—which promote an emphasis on achievement and accumulation—are shown in contrast to a life of meaning, focused on serving and giving back.